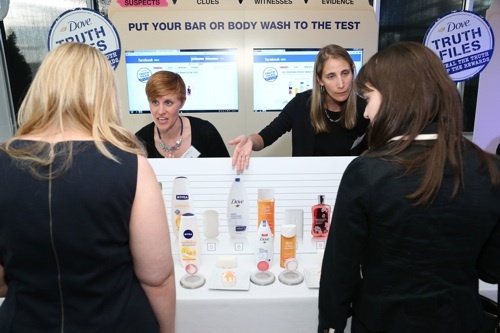 Beauty and the Feast: How did you get involved with Dove and Truth Day? Samantha Bee: Well, it’s a great partnership for me because I’ve used Dove my entire life, since I was a little baby really. My grandma even used their Beauty Bar. I’ve admired their advertising and brand over the years so I thought it was a good fit. BATF: What’s the most surprising thing you found when you were interviewing people on the street about sharing their truths? Bee: It’s amazing how much truth people will lay on you. People told me far too much. We didn’t use a lot because it ended up being so personal! I mean, people told us about relationships that went sour. I think people want to tell their stories and they want to be heard. When you least expect it, they’ll share something deeply personal. BATF: Did you fall for any April Fools jokes? I think I fell for like five. Bee: That’s adorable. Well, I think people know better. And for the record, I did not perpetrate any untruths. I’m all about truth. April Truth Day, through and through. Packed house at the April Truth Day event! BATF: What’s the one truth about you you’d want to share today? Bee: I sometimes hide from my children. Even though I hear them calling my name and I just don’t come out. I don’t respond. I know they’re safe and I know they’re okay, and if I know they’re okay, I just pretend I don’t hear them. Sometimes you have to…sometimes you have to. BATF: What is your beauty truth? Bee: Other than Dove Beauty Bar, I try to leave myself alone a bit. Less is more. BATF: Do your kids love it too? Bee: Absolutely. We’re a Dove family! BATF: Truth: favorite thing about Jon Stewart? Bee: He’s so smart! So, so, so smart. That is the absolute truth! BATF: Best thing working at The Daily Show? Bee: Everyday is completely different. It’s an adventure working there. You never know what to expect. BATF: Are you competitive with your husband, Jason Jones, on the show? Bee: We can’t compete with each other, because I give him all my good jokes [laughs]. We did this trivia game show in Canada and I was obsessed. I didn’t really think of myself of a competitive person but when I was on this game show, I was like, I’m gonna win this thing – like, don’t even try it. It just came out of me! Me and Lara Eurodolian of Prettyconnected.com with Samantha Bee! BATF: Truth, who’s funnier – you or your husband? Bee: Obviously, it’s me. But let’s not tell him that. BATF: He probably doesn’t read my blog. BATF: The other part of my blog is food, so wondering if you have any favorite restaurants in the city that you like to go to with your family. Bee: It’s super fancy, but my husband took me to Le Bernardin for our anniversary and I flipped out. It was my first time there. It was a real experience. When I go out, I mean I have little kids (they’re two-, four-, and seven-years-old), and we don’t eat out too often but I really love good food. So when we go out, we try to make a big deal about it because I just want to be taken care of. I want to be in a soft chair, I want it to be relaxing, I want all the food to be delicious. There, you can’t go wrong. Everything is perfect. BATF: What in your opinion would be the best way to celebrate Truth Day? Bee: Call up one person you love and tell them something true about your relationship. I just made that up right now, but it’s pretty nice, right? 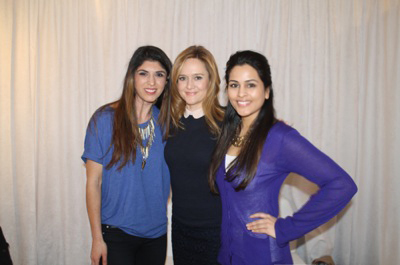 Thanks to Dove and Samantha Bee for taking the time to interview! To learn more about Dove’s Truth Files Campaign, CLICK HERE!